A Turkish tour boat reportedly saved 10 migrants whose 5-meter rubber boat began to sink on their way from Bodrum Turkey's western Muğla province to the Greek island of Kos. The daily tour boat was passing about a mile from the Turgutreis shore when they saw the migrants – 7 Iraqis and 3 Syrians, including two children and a pregnant woman – struggling as their small vessel began to sink. 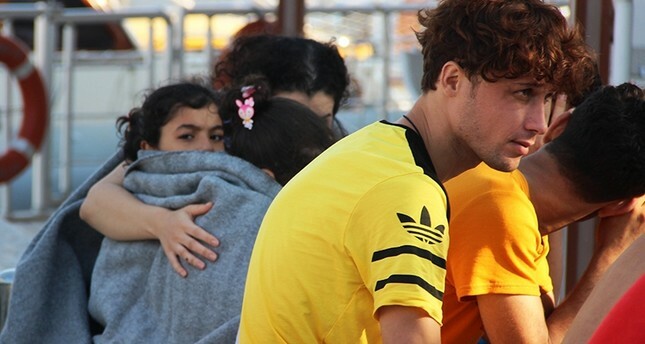 Vakkas Dost, captain of the tour boat, threw lifebuoys to some of the migrants, and boat personnel Sercan Koca and Yunus Durmaz jumped into the sea to rescue the others. The rescued migrants were brought to the Turgutreis Coast Guard Boat Command. The pregnant woman, in poor health, and a man were taken to Bodrum State Hospital by ambulance. "We were going on a boat cruise when we saw people in the water. At first we thought they were surfers, but when we approached, we realized that they were trying not to drown in the rough water, and we noticed the children." "We realized what was happening at that moment and were saddened. There was a great panic, a great risk to life, truly," he said. "As soon as we approached, I jumped into the water. Seeing the children, they were crying and so cold, frozen actually," he added. "She was so scared… when I took her she called for her mother. I understood them because her mother knew Turkish and told me, 'Take my child first, save my child.'" As soon as Durmaz got the girl safely on board, he returned for her mother. Once all 10 migrants were rescued, the crew asked them if anyone was missing. "They said no. We were relieved," he said. Koca and Durmaz said they brought each migrant onto the ship individually and gave them food and water before taking them to the care of the coast guard. "It was a terrible scene, but in the end we were really happy to have been able to rescue them safely," Koca said. Amina Vasabi, a 34-year-old Syrian woman who was among the survivors, told Demirören News Agency that they were trying to reach Greece aboard the boat they bought for $3,000. "It started taking water all of a sudden. It was already moving too slow. We also had trouble to run its engine but did not think about returning to the shore. When it started taking water, everyone panicked. It was a moment of life and death. If [Turkish crew] did not see it, we would be dead," she said. Turkey's Aegean shores have long swarmed with migrants of all nationalities where dinghies would take them to the Greek islands a few miles off the coast. Deaths are common in crossings as many migrants, despite paying thousands of dollars to smugglers, are forced to travel in overwhelmed rubber boats. Though the boats are good for short journeys, they often operate way above their capacity, and more often than not, smugglers leave the steering to the migrants, inexperienced in navigating a crowded boat, and are forced to travel in bad weather, especially in winter. The number of migrants held trying to reach Europe from Turkey using illegal routes has increased by 60 percent this year, according to data from the Coast Guard Command. A total of 14,470 migrants were held in the first seven months of this year, especially in the Aegean Sea, as well as in Turkey's southern Mediterranean Sea and the northern Black Sea, the data reveals. This figure was 9,152 for the same period in 2017. The increase in numbers clearly reflects the impact that the ongoing conflict in Syria and other regional problems have on millions of the displaced and the poor. Europe remains the closest chance for many to have a chance at a better life, although European Union countries where far-right movements that have gained momentum in mainstream politics increasingly tighten measures to stop the migrant flow.